Old Home Week souvenir books were just that — a souvenir of the event. They provided information about the event and its organization, advertising, and pictures and stories about the place being celebrated. The cover of North Bay’s 1925 souvenir book shows Samuel de Champlain overlooking Lake Nipissing. The fact that Champlain spent the night near North Bay in 1615 is emphasized in the history of North Bay as presented in the souvenir book. Running to 120 pages, the book is a reflection of the prosperity of the period. It included a full list of the Old Home Week committee members, the program for each of the seven days, photographs, advertisements and short historical articles. Overall they present a very positive image of North Bay’s history, growth and progress, which is to be expected. Information from the 1925 souvenir book has found its way into other sources about North Bay. Kennedy, for example, repeats many of its stories in his history of North Bay. The Trout Mills Women’s Institute also made use of it when putting together their history of Trout Mills. As one of the few sources of the history of the early days, it retains its appeal, but most of the stories cannot be verified. It seems to have played a role in establishing John Ferguson’s role as the founder of North Bay. A list and summary of articles can be found here: Souvenir Book 1925 List Articles. 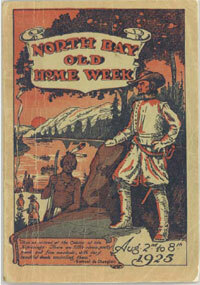 The cover of the English 1935 souvenir book consisted of of an embellished city crest to which was added “North Bay Old Home Week”, with its dates and words from Auld Lang Syne. 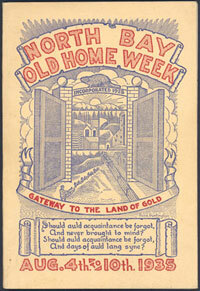 The lower banner was also changed to read “Gateway to the Land of Gold.” The cover was the winning design submitted in a contest limited to school children under sixteen years of age. This French souvenir book is easy to miss. OHW has been translated to “Ré-Union des Anciens”. This book was issued in French for French Canadian Day by its organizers. It included a full list of the executive of the two clubs sponsoring French-Canadian day, the members of the organizing committee, and a brief history of Le Cercle Canadien-Français de North Bay. Only some of the parishes which participated provided photographs, histories of their parish, and advertisements for the souvenir book: Sainte-Anne de Sudbury, Saint Thomas de Warren, Saint Jean-Baptiste de Verner, Sacré-Coeur de Sturgeon Falls, Saint David de Noelville, Notre-Dame du Lac de Lavigne, Saint-Joseph de Chelmsford, and Saint Vincent de Paul de North Bay. Ads were from businesses owned or managed by members of the French community or at least friendly to it. Lefebvre’s Sport and Tobacco Shop in North Bay, for example, is identified as the location where one can procure French newspapers. The emphasis is quite different than in the English souvenir book. There is no article on the Quints, for example, although one ad does mention its location in relationship to them. French-Canadian Day appears to have been a self-contained ethnic festival within Old Home Week. 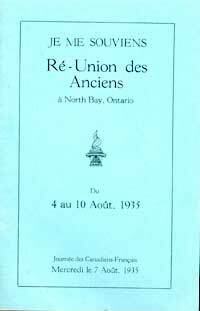 This entry was posted in Celebrations, Community History, Documents and tagged North Bay, Old Home Week, Ré-union des anciens, souvenir books on February 4, 2013 by Françoise Noël. French-Canadian Heroes Honored at North Bay. The Globe, Toronto, Thursday, August 8, 1935. First Page. French-Canadian Heroes Honored at North Bay. North Bay, Aug. 7 (CP). It is Old Home Week in North Bay, and hundreds of out-of-town visitors are here to help the natives celebrate. Parades, ball games, fireworks and sports programs were arranged for the week. Today the city turned out to watch a parade commemorating the deeds of the great French-Canadian heroes. A monument to Jacques Cartier, erected through the co- operation of the French-Canadian men and women of the district, was unveiled. Escorted by police, the procession was headed by the Sacred Heart College Band of Sudbury, followed by automobiles containing clergy of the city and district and Mayor W.G. Bullbrook and D. Barker, Chairman of the Old Home Week Committee. The North Bay float depicted the scene on the arrival of Jacques Cartier in Canada. District Indians joined in the parade, lending color to the celebration with their native costumes. Sturgeon Falls representatives entered the parade with a float portraying Champlain paddling across Lake Nipissing. A descendent of the famous explorer Samuel de Champlain was in the float. Canadian martyrs were commemorated in a float picturing the slaying of a missionary by Indians. The life of Louis Hebert was displayed in a colonial setting. Verner, Ont., French-Canadian residents chose Evangeline as a subject of interprentation and the float was one of the most impressive in the parade. Another tribute to the adventures of Jacques Cartier was shown in a float from Warren, Ont., depicting a party of explorers with their canoe and packs. Twenty-one members of the Turgeon family, on a float, represented Astorville. The program began Sunday and Monday with the first reunion of the 159th Battalion, when more than 400 members of the Northern Ontario unit came together for the first time in twenty years. Chief among the district’s attractions were the Dionne quintuplets at Callander, eight miles south of North Bay, where thousands of visitors gather four times a day to catch a glimpse of the famous babies. “228th Battalion Was Model Fighting Unit,” The Nugget, 4 August, 1925, p. 2. Three Years on Active Service to Credit of Northmen. Any special day of remembrance of the Great War must have for citizens of North Bay and vicinity proud yet bitter memories of its own battalion, the 228th, which left North Bay in the early days of 1916 and returned in 1919 with three years of distinguished war service ito its credit. So today when the returned men and citizens in general pay tribute to the fallen heros of the Great War there are recalled stories of the heorois, the sacrifice and the loyalty of the “men of the North.” Some retunred and some lie in foreign fields. Organization of the 228th was authorized on the first of March, 1916 and recruiting of the unit was commenced about the middle of the month. Three months later the 228th left North Bay 950 men strong for training at Camp Borden. Ninety per cent of the men and officers of the battalion came from North Bay, and places along the T.&N.O. and from as far north as Moose Factory and James Bay. The recruiting officers had among their new soldiers 18 Indians from Moose Factory, who had never before seen any modern methods of transportation beyond their dog teams. When the battalion was later changed to a railway troop these Indian soldiers were among the battalion’s most valued members. The chief officers of the battalion during its organization in the north and its training in Camp Borden and Toronto were Colonel A. Earchman, commanding officer, Major McKee, second in command; Major W.W. Ferguson, Major Lowe, Capt. Dierey? And Capt. ?piers, company commanders. The battalion was in camp at Camp Borden from June until October when it was transferred to winter camp in Toronto, where two companies were stationed at Shaw Street School and two at Gibbons Street School. The offiers and headquarters were housed at Trinity College. Training continued at Toronto until February, when an order came from Ottawa changing the unit from infantry to railway troops. On February 17, 1917, the battalion left the Toronto camp for St. John, N.B., where they spent three days in barracks before being shipped on the Missanabie, which has since been destroyed, and landed in Purfleet? Camp on February 28. In this camp the battalion was re-equipped and re- organized for service in France. The headquarters staff of the re-organized unit were Colonel A. Earchman, commanding officer, Major W.W. Ferguson, second in command; Major A.B. Colville, adjutant; Capt. W. Maglaery, Q.M. ; W.H. Roberts, chief engineer; Capt. Kip?, paymaster, and Major R.B. Smith, transport officer. The company officers were ? Major George McNamara, commanding officer, Capt. Frid?, second in command; Subalterns ? J. Bourke, Davis and S. ? platoon commanders; No. Major D.W. Fraser, commanding officer, Major H.D. McNamara, ? in command, subalterns ? Russell Young, C. Cowan ? Dale, platoon commanders, Capt. Spiers, commanding of[ficer]; Subaltern Naunders, second in [co]mand, subalterns M. Crosby, ? Scallwood and Thomas, pla[?] commanders; No. 4, Major Lewis, commanding officer, ? Piers, second in command, sup? Alterns W.J. Reed Lewis, No? treau, T. Willis and Thomas, co? ?on commanders.
? the battalion arrived in France ? days before Vimy Ridge Hall? in which the members took ? the maintenance of the broad ? lines between Boulognes and ?. Ten days later they were transferred to the fourth army area and took over the construction of all light railways in the Fourth Army area. This? Was continued until Nover 1917, when two companies were sent? to Belgium in the Passchendale fight and two companies remained in the Fourth Army area to ? after the first Cambrai. The ? companies Cambrai built six miles of railway and had traffic running into the Marconne in 24 hours. During the winter of 1917 and the spring of 1918 the battalion looked after the construction and maintenance of railways in the Fourth Army area. In the big retreat of March that year the battalion retired to Domleger and carried on the construction of broad gauge lines until July, 1918, when they were removed to the area in the rear of Amiens. Following the battle of Amiens the battalion looked after the construction of all light railways of the Fourth Army until Armistice, building in all 380 miles of line from August 1 until November 11. After Armistice the battalion was left on maintenance until February when the men were removed to Etaples and there at ready for movement to England where they went into camp at Liverpool before breaking up. Outline of any fighting unit must be a mere shell w[hich] only those who participated can properly fill in the days of discomfort, of near death, of heroism, of sacrifice and death itself. It can be truthfully said that the officers and men of the 228th bore themselves in a manner befitting the sturdy north from whence they came. They returned home with 56 military crosses, 10 distinguished conduct medals and five meritorious medals among the decorations of the unit. Among those decorated were Colonel Earchman the commanding officer, who received the D.S.O., O.B.E., 1914 stars, Victory? Medal, general service, Canadian militia long service and officers long service decoratons; Major Fraser, second in command, who received the D.S.O., general service and victory medals; Major Ferguson, general service and victory medals; Major H. McNamara, general service and victory medals; Major Frid, general service and victory medals; Lieut. Jack Bourke, ? general service and victory medals; Lieut. Amos, M.C., general service and victory medals; Lieut. A. Smith, M.C.? general service and victory medals. The colors of the battalion which were deposited overseas in the chapel at Pottors Har? where the first German Zeppelin was brought down in April 1917, were brought to Canada in April, 1919, and placed in North Bay. The members of the 228th battalion have spread to the four winds. Major H. McNamara and Major Geroge McNamara formed the McNamara Construction Company of Sault Ste. Marie; Capt. Frid is with the Frid Construction Comapany of Hamilton; Mr. Amos is with the C.N.R. at Winnipeg, and Mr. He? is now contracting for himself in the west. The former commanding officer is with the Northern Developmnet Branch at Toronto and in this capacity often meets with former 228th men, who are holding their old positions in the towns of the north. “Life and Development of North Bay for 300 Years Passes in Grand Panorama,” The Nugget, August 4, 1925, p. 1. Life and Development of North Bay for 300 Years Passes in Grand Panorama. Wonderful Parade Which Led Way to Charter Presentation at Memorial Park Was Spectacular Reflection of North Bay From the Earliest Days. Attractive to the highest degree, reminiscent to the point of reality, typically picturesque with touches of pathos and humor, here and there, psychologically arranged, and in all a blaze of color and glory the historical pageant and parade formed a memorable and colorful opening for the Old Home Week festivities and proclamation North Bay as a City. In no other manner could the history of North Bay and incidently Northern Ontario, have been more forcibly impressed than by the elaborate panorama that wended its way through the city in holiday attire. The streets along which the procession proceeded were crowded with people. And as when great Pompey passed the streets of Rome the very housetops were alive in acclamation. Many of the various floats and historical pageants were enthusiastically applauded. Scenes in the parade and at the inauguration ceremony which followed were shot from a thousand angles by amateur and professional photographers. As one beheld the replica, for instance, of Samuel de Champlain and his dauntless followers, bearing hard on their paddles, with their faces eagerly set forth in the direction of the new lands they were to explore, and as one ? the bands of Indians, the gallant courier (sic) du bois or then again, W. Brunett’s old bus with a number of commercial men, “the real pioneers,” driven by a team of horses with a uniformed driver on the seat, somehow or other a spirit of elation forced itself on one’s mind of the romantic struggle that had been a part of the city’s historic development. And then again, with all the hilarity, there was a sense of reverence evident, reverence for the energy and indefatigable efforts which were displayed until now in place of the C.P.R.’s Lucy Dalton, with an ungainly [smoke] stack and an apologestic squeak of a whistle, there are furio[us?] monsters rushing from coast to coast; in the place of a priest riding in a cart with a wooden cross and a few followers afoot, there are now churches and cathedrals and prosperous appearing parishioners; instead of Indian huts and grotesque totem poles, there are fine homes and cities. The parade lined up shortly before ten o’clock, the time that it was scheduled to commence, on Main Street, with the business floats assembled in the Planing Mill yards. Leading were marshals and heralds on gaily decorated mounts. These were followed by the Boy Scouts Band on foot, led by Scoutmaster Anderson, with the Girl Guides, led by Mrs. Anderson, following. Many hundreds were gathered about the scene of the assemblage and a large number followed the pageant from the time that the signal to commence was given until it arrived at its destination at Memorial Park, where, with the exception of the float with the Queen of the Carnival, all temporarily disbansed, to make way for the memorable even of the day, the presenatation of North Bay’s Charter. The route of the parade was down Main Street, along Fisher Street, to First Avenue and thence to Memorial Park, and the procession extended for the length of about six city blocks. As has been intimated, the outstanding attraction of the parade were the fraternal floats. Eadh of them depicted interesting incidents of long ago, from the time of Old King Cole to the arrival of Champlain among the Indians. The float arranged by the Lions Club gave an intimate and true conception of the home life of the Indians. There was an Indian teepee concealed in a background of small evergreens while the door of the teepee was guarded by a squaw with a circle of Indian braves, highly painted and in full regalia, squatted in a circle about her, with bows and arrows by their side, peace pipes flourished incessantly and a small camp fire smouldering inconcernedly. In a cage at the side was a small doe, while the Lions took advantage of the opportunity to proclaim their identity by having a small lion concealed in the tent, the roars of which may or may no have been magnified by some contrivance of human design. The Knights of Columbus portrayed the early arrival of Champlain. He was the first of the party and was shown as gazing from the top of a hill over the surrounding country while his companions were landing the rest of the flotilla. A large pointer, arranged by the Elks Club, recalled the drive among the hazardous Canadian waters. The boat was capably guided by real old timers whose tattered costumes and hardened faces foretold hardships of long ago. The voyageurs propelled the boat with three pairs of oars and an experienced boat man in the stern directed it down the stream. The Commercial Travellers Club brought back a more recent picture in the developmnet of North Bay. An old fashioned bus driven by horses revealed the conveyances of the old pioneers. The driver was attired in a costume indicating the childhood days of the city. The Masons float was a characterization of Old King Cole and his Merry Fiddlers. His servants attended and saw that his bowl was kept full. The King assumed a humorous attitude and his minstrels played the old time tunes. The celebrated pipe was very much in evidence and was quite in harmony with the bright costumes and the stately chair of the king. The railways, which have been one of the main factors in the establishment of North Bay as a city, were magnificently represented. One of the most appropriate floats in the whole procession was that of the T. & N.O. depicting the advancement of Northern Ontario. At the front there was a tableau of life on the farms, then a scene of mining men, engaged at work, and thirdly a scene displaying sport life of Northern Ontario, hunting, boating, fishing. From an artistic standpoint the most elaborate float in the procession was thet (sic) of the C.N.R., a coach was elaborately bedecked with a profusion of flowers, while a design, “From coast to coast,” was also engraved in luxuriant masses of lilies. The C.P.R. was represented by the Lucy Dalton, the first railway engine in Northern Ontario, drawing a miniature caboose with the conductor and the brakie in uniform on the steps. The engine was driven by a gasoline motor but nothing was lost to the realistic appearance as the engineer and firemen were in the cab, smoke issued forth and a whistle tooted incessantly. There were countless floats arranged by business houses and stores in North Bay all of which were handsomely decorated, while of more than usual interest was the pageant of the Queen of the Carnival, who was imposingly stationed on a throne with ladies in waiting and pages grouped about. An added attraction was the music rendered by the Stratford Band, the North Bay Premier Band and the Clowns Band while the Englehart pipers were also in attendance. The Forestry Branch, Rotary Club, Police and Fire Departments were also represented. The first auto in North Bay, the first post office and other scenes typical of the olden times were included. Nothing was overlooked in the presentation of the humorous aspect to the spectable which was in evidence throughout. The old police dogs, the police patrol and a ravenous gang of fire eaters provided no end of merriment. The police dogs were a formidibble looking outfit and even the horse which was drawing the patrol had occasion to balk a couple of times while a youth with a fire extinguisher seated on the fire fighter’s cart had the time of his life in squirting drops of water at the spectators. No one could have enjoyed himself more than did that youth. The clowns performed in usual style. One with a monstrous bow tie, and a pair of shoes as incredibly large, attracted considereable attention while among the merry markers were a number of dancers who executed everything from the “Hootchie kootchie” to the highland fling and before the end of the parade were calling for talent from the throng. A fiddler situated in a prominent position ground happy melogies such as the “Little Brown Jug” and “Casey Jones” while the dancers staged the “elemand left” stunt and other men dressed as ladies crossed their lily white hands and the genist? with their black and tan gave little doves a healthy swing. Even the officials of the committee on arrangements were astounded when the mass of floats gathered at the west end of Main street, between 9 and 10 a.M. It was a sight that will live long in the memory of everyone who lined the route of the parade. Only about 40 minutes were lost in the starting of the long line which was remarkable in view of the fact that the Marshals had to set every individual float in its proper place. At the outset, it appeared as if the noon hour would pass before the parade would be underway but in a remarkably short time, after the Parade committee got down to work a confused mass was untangled into an impressive spectacle. From start to finish the Pageant moved over its prescribed route. A little delay occurred when the tail-end was stopped on the Main street. But it was all for the best as it enabled the crowds to witness the antics of the funny characters. Among the characters in the Pageant section a lot failed to recognize T.J. Bourke representing Father Le Caron of 1615 vintage. Every member of the Lions float, the Indian settlment were ? in spledid form. John [several words blurred] in Canada in [three lines blurred from damages to the original paper] ed the early missionary, was also good in costume. Chas. St. Germain represented Champlain on the Knights of Columbus float. The design and characterizations on this was one of the best in the parade. Lottie Britton and Alex Gillie, employees of the Canadian Pacific Railway in the early days, piloted Lucy Dalton, the replica of the first engine used in the service along the streets. Wm. Dreany and Harry Hughes looked out from the tail end of the caboose as they did when North Bay was only a water tank and a few surrounding shacks. Bill Rankin was telling a whole lot when he caused his first mode of transportation to appear on the streets. Very few, however, thought it was so far back. Harry Quirt was noticed perched up as a character in the T & N O float with his famed violin resting under his chin. Harry still dr[aws] a wicked bow ? caused old feet to ? as he ? notes. “History, Art and Character Contributed to the Parade by the Three Railway Floats.” The Nugget, August 7, 1925. The contributions which the three railways connected with North Bay made to the Grand Pageant and parade which was staged on Monday and was repeated on Wednesday morning were worthy reflections of the high place which the railwas have occupied in the development of North Bay. Visitors here during Old Home Week who have seen exhibits of a similar nature in various large centres of Canada and United States are responsible for the statement that nowhere yet have a string of floats been contrived with so much attention to historical, artistic and characteristic detail as those which represented the Canadian Pacific, Canadian National and Temiskaming and Northern Railways in the Old Home Week pageant. Naturally the Canadian Pacific Railway’s contribution formed the most historical part of the long parade. It took the form of an exact replica of “Lucy Dalton,” the old wood burner that was named after the sister of Lady Lisgar, wife of the then Governor General of Canada, and which for several years in the early days of the C.P.R. development steamed regularly between Ottawa and Prescott. Afterwards, as No. 9, the Lucy Dalton was one of the first locomotives to ply between North Bay and Mattawa in early construction days. The original Lucy Dalton was built in 1872 in Tonton, Mass. and has long since been discraded as scrap. The Lucy Dalton which tooted and puffed its way down North Bay streets in the middle of the parade with wood tender and caboose attached, is an exact replica copied off an old photograph and designed and manufactured especially for Old Home Week’s pageant in the back shop of the C.P.R. locomotive works in North Bay. Besides Lucy Dalton herself, particular interest attached to the crew who named (sic) [manned] the old-timer on Monday and Wednesday. On Monday in charge of the train was conductor Harry Huges, superintendent at Ottawa and a former trainman of many years experience at North Bay; William Dreany alderman and veteran yardmaster of North Bay, as brakeman, while the engine crew consisted of no less than Alex Gillies of Chapleau, one of the oldest enginemen on the orad, and Lottie Britten, who actually fired the Lucy Dalton herself in the days when the fuel for a trip between North Bay and Mattawa consisted sometimes of two cords and sometimes not quite two cords of wood. The interesting contrast between the Lucy Dalton, representing the first locomotive to steam out of North Bay and the present monsters of the road was given to history on Thursday morning when the replica which appeared in the parade was drawn up beside No. 5323 th, the latest type of freight engine plying overland on the C.P.R. and a photograph is being sent to Mr. H. J. Humphrey, general superintendent of the North Bay-Algoma Division, who is confined to the General Hospital, Toronto, through illness. The float was designed in Toronto by Mr. William Hoath, florist in collaboration with Mr. S.G. Skinner, landscape gardener for the Canadian National Railways. With the horses it was shipped to North Bay on Sunday night and a fresh shipment of flowers was received for its redecoration for Wednesday’s parade. There were approximately 10,000 flowers used in the preparation of both floats, including over 600 Easter lilies, some 5,000 gladioli, 2,500 asters, 800 larspur, 400 delphinium all mingling with over 4,000 spreys of cedar. Baby’s Breath was used in large quantities to emphasize the coloring and added effectively the delicate appearance of the display. The total weight of flowers in both floats is said to have been approximately 1,300 pounds. No pains were spared in making the float as attractive as floral and artistic temperament could affect and the result proved to be one of the finest spectacles ever seen on North Bay streets. Realism was the keynote of the truly northern float of the T. & N.O. Railway which appeared in Monday and Wednesday’s parades. It portrayed the growth of the North through its three main industries. The T. & N. O., accompanied by the officers of law and order, opened Northern Ontario first as a farming district for the T. & N. O. was originally a colononization railway. Then when mining wealth was found the railway provided means of bringing into the mining district working material and men and carrying out to the market the silver and gold. Now the district along the railway is being sought as a sportsmen’s paradise of beautiful scenery and fine fishing and hunting. The first section of the float depicted farming life and the violin which was played by Harry Quirt of Nipissing Junction is claimed to be the first violin to bring music to North Bay. Mr. Quirt came to North Bay in 1881 and pitched his camp under three balsam trees on the present site of the C.P.R. roundhouse. The second section of the float depicted mining with the canvas of the float painted to represent the interior of a mining shat with its veining of precious metal. The drill used on the float was imported from a Cobalt mine for the occasion. The third section of the float pictured a sportmen’s camp with great realism. The Indian guide was not other than Frank Commando, chief of the Nipissing tribe, while the fish were brought fresh from the water of Lake Temagami. The float originated in the mind of A. B. Odlum, of the T. & N. O. staff, while Russel Huntington took charge of the designing. The float was built and painted in the shops of the T. & N. O. and was carried from the idea to the finished product in two weeks’ time. “Gathering at Banquet Table Closes French-Canadian Day,” The Nugget, August 9, 1935. As a glowing finale to French-Canadian day of North Bay’s Old Home Week, more than 500 persons gathered in St. Vincent de Paul’s parish hall Wednesday evening for a banquet under the auspices of La Federation des Femmes Canadiennes Francaises. Dr. J.E.I. Joyal presided during the occasion and announcement was made of the winners of the parade held in the afternoon. North Bay’s entry depicting the arrival of Jacques Cartier was adjudged of highest standing, receiving about double the number of points of the remainder but owing to the fact that the North Bay parish was acting host for the event, it was eliminated from the prize list. The Jacques Cartier representation was planned and arranged by Isaac Bedard and was highly complimented. Warren with another Jacques Cartier float received the first prize, Verner represented by Evangeline, second, and Sudbury with a setting of the slaying of Candian Martyrs, third. The awards were in cash. Judges were Dr. F. Malo, Warren; Dr. J.V. Menard, Verner; J.A.S. Plouffe, Sudbury; Achille Michaud, Sturgeon Falls; Police Chief W. Clark and D.L. Regimbal, North Bay. Grace before the meal was said by Very Rev. Dean J.A. Chapleau. The orchestra which was in attendance was in charge of Alphie Parisen, with Antoine Levesque, B.A., at the piano. The toast to the pope was offered by Rev. L. Mailhot, S.J., Sudbury; and responded to by Rev. O. Racette, Verner. Rev. L. Seguin, Hanmer, first parish priest of St. Vincent de Paul congregation, proposed the toast to the parish recalling that besides being first parish priest, he helped lay the first stone, put in the last nail, said the first mass in the Church and “the following day took a second class ticket to the smallest parish of the diocese.” J. Harry Marceau, M.L.A. responded. Le Cercle Canadian Francais was feted in a toast proposed by Emile Bedard and responded to by P.H. Bonhomme. The toast to the old parishioners was offered by Wilfried Aubry and responded to by L. Gauthier, Sudbury. Elie Cholette offered the toast to the visitors to which Albert Michaud, Sturgeon Falls, responded. In proposing the toast to the ladies E.A. Lapierre, Sudbury, cited their great work in the development of the north country and the vigor with which they aided their menfolk. He said that this trait was also remarkable during the time of depression. D. Moreau responded. Very Rev. Dean J.A. Chapleau addressed the gathering expressing his appreciation of the co-operation received in the planning and carrying out of the day. In speaking to those present Mayor W.G. Bullbrook voiced his thanks for the part of the French-Canadian citizens in undertaking an Old Home Week day, which proved very successful. Gratitude was expressed by Emile Regimbal, president of Le Cercle Canadien- Francais for the success of the day, with particular mention being made to Dean Chapleau, the speakers, members of the clergy, Father Mailhot for the presence of the Sacred Heart College band, the visitors, the judges, the mayor, the president of the school board, M.J. McGuinty, who was present, and to members of the committee and La Federation des F.C.F. “Old Timers Fail to Recognize Town They Left Years Ago.” The Nugget, August 7, 1935, front page, 2. Memories of North Bay when it was only a struggling backwoods town, when rocks sand and stumps were everywhere, when, there appeared little likelihood that anything would come of the attempt to establish a settlement here, when a large lot at the corner of Main and Ferguson streets sold for $25—all these were recalled for The Nugget this week by old timers who have come back for Old Home Week. Although several of the visiting pioneers were contacted for their memories, and for their opinions of the city of today, it was impossible to reach even a small portion of the large number who have returned to their early home. From the moment an old timer arrives in the city he, or she, is so busy shaking hands with old friends, and going from place to place in a round of calls, attempts to find them at a definite place are almost futile. The Old Home Week registration bureau located in the Board of Trade Information Bureau has been the mecca for hundreds of old timers, however, and here it is possible to contact a few of the many who have come to town. “Why if we stay here a few days longer, we will be moving back,” was the way John Scott, a veteran C.P.R. engineer summed up, and so saying about expressed the reaction the North Bay of today. Incredulity that a city could have sprung from the humble beginning of the early 80s, the thought that “North Bay would always be home” came from other old timers, as without exception they waxed enthusiastic over the old days and the new. Fifty years ago the corner lot on which T.M. Palmer’s jewelry store now stands, at the corner of Main and Ferguson streets, was just sand, rock and stumps, and was sold for $25, W.J. Kellogg, a veteran railroader recalls who used to make his home in North Bay recalls. With Mrs. Kellogg, the former Elizabeth Foster, one of the city’s pioneer school teachers, Mr. Kellpgg travelled from Desbarats, near Sault Ste. Marie to be in the city for Old Home Week. Desbarats and then chatting with Mr. Kellogg. While coupling cars at Desbarats some years ago, Mr. Kellogg lost his right arm, but trained himself to work a telegraph key by his left hand. He will in 1936 complete 40 years as a member of the telegraphers’ union. In Mrs. Kellogg’s teaching career, she was one of the first teachers in the old “log school.” Later when the city’s first permanent school was erected, the present Worthington street school, she moved to that building and taught there for a number of years before her marriage. Comparing the cities of the North with those of 40 or more years ago, Mr. Kellogg recalls that North Bay, Sudbury and Sault Ste. Marie were straggling villages in those days, and that there were no settlements what-ever north of these centers. Jack Shotton, another old-time railroader, now retired and living at Montreal, is a visitor to the city for Old Home Week. The son of a former C.P.R. locomotive foreman here, Mr. Shotton rose to be district master mechanic on the C.P.R., stationed at Brandon, Manitoba. W.J. Johnson, a former C.P.R. engineer at North Bay, and now a Canadian National Railway engineer at Hornepayne, recalled with George W. Lee the days of long ago when he was engineer on a construction train, and Mr. Lee was “slinging ties” in railroad parlance on the same train. Stationed at Hornepayne for the last 19 years, Mr. Johnson is visiting the city for the first time in several years. Although he has been away for some time, Mr. Johnson says that North Bay will always be home to him. Before Canadian Pacific Railway track- laying crews reached North Bay in September, 1882, two Canada Central train crews from Pemborke were sent to Lake Nipissing to superintend the loading of ties and timbers for shipment to Mattawa, whence they found their way into Canada Central tracks. One of the members of those train crews was Patrick Carmody, the engineer who piloted the first C.P.R. construction train into North Bay, right on the heels of the track layers. Today Mr. Carmody is back in the Bay for Old Home Week, back to a city which was a struggling settlement of a few hundred souls when he left in 1887. With Mr. Carmody on one of those Canada Central crews in 1882 was James Fallon Sr., one of North Bay’s oldest residents, and the man who stoked the first C.P.R. train piloted by Engineer Carmody. Leaving North Bay in 1887, Mr. Carmody successively worked on the Great Northern Railway, the Montana Central, and the Butte, Anaconda and Pacific in the United States, before going to Anyox, British Columbia, where he was for several years employed at the huge Granby Consolidated smelter, which closed down a few weeks ago after many years steady operation. “I suppose there are a lot of changes since you left here in 1887,” The Nugget suggested. “Why I hardly knew where I was until Jim, (Mr. Fulton) took me down and showed me where the old “Red Row” used to stand, and to the lake where the old dock stood. North Bay has grown into a marvellous city since I left it,” Mr. Carmody enthused. “If we stay in the city a few days longer, the first thing we know we will be moving back,” John Scott, another North Bay old timer, and now a resident at Trenton, told the Nugget in a brief moment of recollection Tuesday afternoon. When we first came to North Bay, in the summer of 1883,” Mr. Scott said speaking of Mrs. Scott and himself, “the C.P .R. was still under construction between here and Mattawa. The only buildings erected then were Doyle’s boarding house, McFarlane’s boarding house, and John Ferguson’s log home. It wasn’t long though, before the row which was later to be known as “Rogers’ Row,” then “Green Row”, and later “Red Row” was started. I can well remember when the men were working on that they had to be careful to always stand on a board, or they would sink up their knees in muskeg. A charter member of Nipissing Masonic Lodge, and a member of the first board of Rev. Silas Huntington’s pioneer Methodist Church, Mr. Scott spent several years in the old city as a C.P.R. engineer. Leaving in 1888 because of Mrs. Scott’s poor health, Mr. and Mrs. Scott made their home in Toronto, although they lived a few years at Kenora. While running out of Kenora, Mr. Scott was engineer on the first C.P.R. train to enter Winnipeg, then a small settlement like North Bay. After residing in Toronto for several years Mr. and Mrs. Scott moved to Trenton where they now make their home. Mr. Scott is retired, and owns a small farm on the outskirts of Trenton. After having travelled from coast to coast in Canada several times, I have yet to find a town which has made such fast progress in the last 25 years as North Bay.” Such a tribute was paid this day W.J. Major, Ottawa, who with Mrs. Major is visiting Mr. and Mrs. W.B. Childerhose, 418 Main street west, for Old Home Week. Mr. and Mrs. Major resided in North Bay from 1882? until 1890?, when they moved to Ottawa. Familiar with this part of the province since 1884, Mr. Major was with the car department of the C.P.R. and estimates that at the time of his residence here the population was about 2,000 persons. He recalls working with George Bury, now of Vancouver, who will be remembered by many of the old time residents of North Bay. In the latter years of the 19th century, the town was progressing rapidly. It boasted four hotels, the Mackey House, Winnipeg, Queen’s and Pacific and six churches, St. Andrew’s, Presbyterian, Methodist, Baptist, Anglican and Roman Catholic. During their visit in the city for Old Home Week Mr. and Mrs. Major visited the house they built while living here. Of brick veneer, it was moved from its former site, the corner of John and Railroad streets, when the T. and N. O. tracks was laid and now faces north on Main street. Although built in 1906 the house is still in good condition. Mr. and Mrs. Major agreed that if they were to move again they’d come right back to North Bay where they both have many friends. On this trip they are returning from the Peace River district, where they visited Mrs. W.H. McNeil, Beverlodge, and where for three weeks they were detained because of floods. “Festive Week Is Formally Opened.” The Nugget, August 5, 1935, Front Page. After hiding behind dark clouds for more than twenty-four hours, the sun came out in all its glory this morning, to add its part towards making the opening of North Bay’s Old Home week a perfect ceremony in an ideal setting. Forebodings of bad weather were tossed to the winds with the light of the sun, and the biggest week in the history of the city was opening in an auspicious manner. Actually, the week got underway on Sunday with the re-union activities of the 159th Battalion, but the week was formally declared officially opened at fifteen minutes before noon today by Mayor W.G. Bullbrook, in the presence of a number of visiting mayors, legislators and more than 500 citizens and visitors, at Amelia Park. Before the formal opening ceremonies, one of the longest parades in the history of the city moved from the west to the east end of Main street, passing before thousands of people who lined sidewalks. Conservative estatimates placed the number of people who witnessed the parade at more than 20,000. Speaking first, Chairman Barker bade welcome to old timers, and thanked his committee members for their efforts in behalf of Old Home Week. He wore a large silver badge presented to John Fersuson at the time of the 1925 festival. Introduced by Chairman Barker, Mayor W.G. Bullbrook presented to the audience Leona Falconia, Feronia, Homer Grainger, 155 Princess street east, and Mildred Doucette, Nellie Lake, all children born in North Bay during Old Home Week 1925. The mayor recounded the obstacles which had been overcome by the Central Committee in bringing to fruition the efforts of months past, and promised his hearers, that the city was “wide open” during the coming week. Mayor A. K. Grimmer, brought greetings to Old Home Week from Timiskaming, Quebec, and promised that with the opening of a motor road connecting the two cities, there would be many visitors in North Bay from Timiskaming. “If that road were open now, there would hardly be a person in Timiskaming who would not come down here sometime during Old Home Week, and I can assure you that with the opening of a road, we are looking forward to becoming even closer friends of our North Bay neighbors,” Mayor Grimmer promised. Alderman G.E. Palmer, secretary of the Old Home Week Central Committee, expressed satisfaction which he said mus come to all members of that body, to witness the success of the opening ceremonies. “The greatest satisfaction in life is the work done for events such as this,” Alderman Palmer concluded. Other speakers during the opening ceremonies were: Captain Ellwood, the Salvation Army; J. Harry Marceau, M.L.A. for Nipissing; Dr. J.R. Hurtibise, M.P., Sudbury; Mayor Cameron, Iroquois Falls, and Mayor Wainwright, Cobalt. During the opening ceremonies, Mayor Bullbrook announced the winners of the prizes for floats in the parade. First prize was awarded the Cercle Canadien Francais, for their tableau depicting the landing of Jacques Cartier on Canadian soil, planting of the cross, and welcome by the Indians. The Travellers’ battleship float, directed by Pilot Paddy Patch took second prize. It was a complete “fighting unit” even to shots fired from guns on the forward deck. In nautical uniforms, the crew of travellers sailed Main street for second prize. Third award was to a decorated car advertising “Spirella Corsets.” Fourth prize for a miniature Italian city, was won by a group of merchants and citizens of that nationality, who sponsored the float. For miniature planing mill, turning out lumber at a great rate as the parade progressed, the Standard Planing Mills carried off fifth prize. Judges of the floats were: A.T. Smith, D.J. Morland, John Blanchette, and T.J. Patton. Thousands of citizens and visitors lined Main street to watch the colourful and eye-catching parade which marked the opening of North Bay’s Old Home Week. North Bay’s main thouroughfare probably never held so many people as it did for a few hours this morning. Gorgeous and realistic floats, bands, ex-service men, dignitaries, comedians, odditities and a festive spirit all combined to make the mammoth procession one of the greatest in the history of the city. It was a fitting grand opening to North Bay’s big week of celebration and entertainment. The parade was about one mile and a half in length and took 20 minutes to pass a given point on Main street. The holiday spirit was in evidence everywhere. Grown-ups and children alike entered into the spirity with unbounded enthusiasm. Kiddies were wide-eyed and happy, and adults were not far behind in the expressions of their delight. Applause greeted many of the displays. Some of the floats were excellent in every detail, showing that a great deal of work and artistry had been brought into play during the arrangement of them. Policemen headed the parade. Behind them marched the band of the 159th Battalion. Today, as was Sunday, is being sponsored by the 159th Battalion in the form a a re-union. Members of the battalion followed their band. They turned out for the occasion in large numbers and looked smart in their jaunty berets. A dugout with sand bags and all created a battle scene that went over big with the spectators. This float followed behind the veterans. Five ex-servicemen, who are leg amputation cass, trekked the entire journey from the old rink site to Amelia Park. A historical panorama in North Bay’s growth appeared in the city float which was built on the fire department’s ladder truck. Surveyors were shown looking over the country in 1882, and another section of the display comprised a hunting and fishing scene. Miss North Bay of 1935 was seated on a lofty throne. The two children who were born here in Old Home Week, 1925, were also on the city float. Government, civic and Old Home Week officials then passed in cars. They were followed by the pipe band. Ex-service men who are not members of the 159th Battalion marched behind the plaided-skirt pipers. “Hap” Watson, Toronto, better known as “Pigskin Peters” of “Bird’s Eye Center” fame, was perched on the back seat of in a little car. He was decked out in the uniform of the Toronto Maple Leafs baseball club. The Spirella Company had a car completely decorated in orange colors, a pretty sight. It was awarded third prize. Crawley and McCracken, caterers, showed a kitchen with the cook going about his duties. Lions and Rotary International was portrayed by a huge globe on a float done in the clubs’ colors. The Shriners’ float blasted forth rousing music. Representing the Associated Canadian Travellers a miniature warship the H.M.S. Traveller, drew favourable comment. The ship, manned by men in naval uniform, was a remarkable likeness of a genuine cruiser. The float was given second prize. The bugle band of the North Bay Collegiate Institute and Vocational School took part in the procession. Numerous business concerns were represented. The Italian boys’ band also marched. One of the finest floats in the entire parade was the one entered by Le Cercle Canadien Francais. Enthusiastic clapping greeted its appearance. It represented the arrival of Jacques Cartier in 1534 and was clerverly done up in all details. It was awarded first prize. The planting of the cross and the French flag was realistically portrayed by performers dressed in true style of that period. Indians were seen greeting the newcomers to the land of widerness. Other showings included a car of ancient vintage, a bicycle built for four, cowboys, comedians, a miniature setting of Palestine, a Public Health office, genuine Indians at their wigwam, decorated bicycles, a windmill, and many other things. “Impressive Tribute Paid Solider Dead,” The Nugget, August 5, 1935, p. 3, 5. Their name liveth forever more. Solemn, with a touch of sadness, yet inspiring for all its solemnity, was the drum- head memorial service at Lee Park Sunday afternoon, and the ceremony at Memorial Park in the morning. Perhaps the most touching feature of the service was the placement of a wreath at the plaque of the unknown soldier. While the band softly played a funeral march the wreath was deposited on behalf of the 159th Battalion by Col. E. F. Armstrong, officer commanding. It was a tense moment for all, particularly the veterans, who were formed up in a square facing the drum-head. In his address, Rev. Mr. Wallace outlined the true meaning of the terms patriotism and self-sacrifice, stating men who went overseas set up real examples of these virtues. “The real cause of the war,” he said, in reviewing the struggle’s beginning briefly, “was Germany’s desire to rule the world. We didn’t go to war to make the world safe for democracy, through that has become the popular belief. We entered the fight for liberty, freedom, truth, justice, and honor. The men who went to war believed those things worth fighting for. “Today it almost seems as if the soldier is an outcast” Rev. Mr. Wallace continued. There has been so much preaching against armament, so much talk of pacifism and world peace forever, he contended, that the men who fought in the Great War had almost become outcasts. Captain T. Ellwood of the Salvation Army pronounced the invocation following the doxology which opened the service. Two hymns followed, then a scripture reading by Rev. Garland Gladstone Lacey. A short prayer by Rev. H.A. Sims followed the laying of the wreath. After Rev. Mr. Wallace’s address one minute of silence was observed in honor of the fallen. A trio of bugles sent the “Last Post” shrilling into the breeze. The benediction was pronounced by Rev. (Captain) P.C. Reed. The National Anthem closed the service. Arrayed in their berets and badges, members of the 159th Battalion presented a colorful and smart appearance as they paraded to and from the park. The All Verterans Band was under the leadership of Frank Saunders. The “Order of Service” was presented to the 159th Battalion Association by Mrs. John G. Ross, in remembrance of her brother, Lieut. W.K. Clarke, killed in the Great War March 7, 1918. A plea for a continuation of the war to end war, on behalf of God and in the interests of world peace formed the theme of Capt. Rev. P.C. Reed’s address to the members of the 159th Battalion and other units at the Sunday morning memorial service in Memorial Park. Classing the war against war as one from which there is no discharge save death, Capt. Reed pleaded with his hearers to strive as citizen-soldiers to leave behind them a mark of accomplishment towards this end, Canada’s citizen soldiery was classed as the bravest in the Allied forces during the World War, and that reputation must be upheld in the new war, Capt. Reed exhorted. onets that we are fighting now,” Capt. Reed explained, “but a war which we must fight, not against God, as some said we were in the last war, but for God and against sin and selfishness. We cannot stand further losses from war, but we must continue in this great war for God. “Captain Rev. Stanley Lambert, the padre of Christie Street Hospital, Toronto, said recently that every fifth day since the end of the war, a soldier has died in Christie Street Hospital. Like the Olympic, which was discharged recently after long years of service, and like the troop ships which received their discharge while on service, all of those vessels a lot of you boys will know, the old soldiers are getting their discharge,” Capt. Reed explained. “From this new war against war and sin, however, there can be no discharge, a vote which the men who profit from warfare are trying to discourage. You who know the hell and horrors of war should be leaders in this great battle which all citizen-soldiers are fighting today. “I am reminded today of a spot near Seaforth in England, where I once say a blooming field of oats, and just below the top of the oats were blooming red poppies. Then I am reminded of another field, in Flanders, where red poppies bloom amid the crosses, where lie our comrades. It is the death which the poppies signify in Flanders that is the penalty of war, and it is the life that the poppies signify in Seaforth that we want to preserve, that we are fighting to preserve in the great war we are fighting today, for peace,” Captain Reed concluded. The service at Memorial Park was in charge of Rev. H.A. Sims, assisted by Capt. Reed, and Rev. G.G. Lacey, who pronounced the benediction. The 159th Battalion Band accompanied the assembled veterans in the singing of “The Son of God Goes Forth,” prior to the address, and “Rock of Ages” at its conclusion. Sgt. Major A. Collier, Sudbury, sounded the Last Post and Reveille. To veterans from the 159th and other units massed on three sides of North Bay’s war memorial, and to listeners who spread back almost to the First avenue sidewalk, Rev. Mr. Reed voiced his message. A parade from the Masonic Hall by way of main street preceded the service. To the west of the monument the 159th band was drawn up, grouped there after leading and marching men to the park. To one side of them were the bagpipers and drummers of the North Bay Highlanders, and with them the Bugle Band of the Algonquin Regiment. More than five hundred citizens and visitors attended the memorial service, joining their voices with those of the veterans in the hymns, and repeating with them the Lord’s Prayer after Rev. Sims. Surrounding the park on three sides were rows of parked cars, their occupants joining with the veterans in tribute to their comrades who died in France, and whose memory they honored by the service along with other soldiers who fell in the Great War. “Women Played a Great Part in Development of City,” The Nugget, August 5, 1935, p. 10. The North Bay of today, with its fine city streets and modern structures is a far cry from the little settlement huddled about the C.P.R. station which marked the site when the first woman arrived at this Gateway to the North, about 50 years ago. The one board walk extending along the only travel way, now Oak street, was laid with planks placed lengthwise. The few make-shift dwellings faced the station and the C.P.R. “Red Row,” the last house of which stands on C.P.R. property at the corner of Ferguson and Oak streets. About this little active spot in the wilderness, pierced only by the twin rails of a great transportation company, the C.P.R., lay an area dotted with innumerable stumps, the first evidence of clearing operations. At first, social and church activity was nil but, in the secluded settlement a spirit of friendship in common sympathy soon sprung up and the populace turned their minds to entertainment. Travelling troupes of entertainers were soon including North Bay on their itineraries and it was not long until an amusement hall was erected west of the settlement proper. Since church services were at this time held only upon the visits of missionaries and in box-cars on the rail tracks, church organization was devoid. It was not until Methodists, Roman Catholics and Presbyterians had united in their respective bands that the spirit of fellowship really bloomed. The “Park,” now Amelia Park, was a popular location in those out-of-town gatherings which characterized the early days of North Bay. Church congregations organized picnics and the whole colony turned out. Visitors from as far as Ottawa arrived by train for these far-famed events when jollity and care-free merriment were the only watchwords. Large banquet tables were laid in the open air and the country picnic of tradition was on. A remarkable annual event, organized as the town grew in population and the surrounding territory became broken by farm houses, was the Agricultural Fair also held at the Park. It was an occasion long looked forward to each year. Fine specimens of animals and farm produce were exhibited for awards. The first women’s society active in the settlement was the Women’s Christian Temperance Union which still functions in the city of today. Its organization was prompted by the open bars of that time which were the mecca of lumbermen travelling through the little colony. The first sport participated in was lacrosse. Enthusiastic encounters of this play, originated on the Ottawa River, drew practically the whole village. The early days were hard for women, no lights, now water and no conveniences, such as are taken for granted today. Water was carried from Lake Nipissing for some time and later it was hauled in barrels by team, to be sold for 25 cents a barrel. There was only limited hotel accommodation for new arrivals who were not yet established, and the village folk were forced to take them into their homes. “The Blue School” will be remembered by pioneers of the district. It was built on McIntyre street when accommodation at the first little schoolhouse was found wanting. The start of the Temiskaming and Northern Ontario, and C.N.R. railways expanded the settlement. The three transportation systems put North Bay on the map. Except for the passing of Samuel de Champlain, the North country was shrouded in oblivion until the C.P.R. rails pushed through the wilderness. The establishment of T.& N.O. connection with the North made North Bay a terminal point, through which all traffic to the rich mining areas must pass. After the construction of the first churches, the ladies of the town centred their activities about them. Picnics and social affairs were arranged and advertising was done by announcements from the various pulpits. Dramatic societies were organized and their efforts provided a variety of entertainment. In the early days of the 20th century many social organizations were formed providing gathering places for the women of the town. The most prominent of these was one which is still flourishing in the present-day city, the Women’s Canadian Club, a society alive with patriotism. Reminiscent tales of North Bay’s early days were on the tongues of everyone as pioneers were reunited.